Help Leia keep her farm in a beautiful farm story. 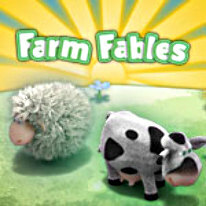 Join Leia on a two year adventure as you harvest through the seasons and help her keep her farm in Farm Fables. Grow your plants, look after animals and use tools to develop your farm. Upgrade your farm to create ice-cream, milkshakes, cake and lots of other tasty treats. Use strategy to keep your farm running through sun, rain and snow and make a new life in this beautiful farm story!